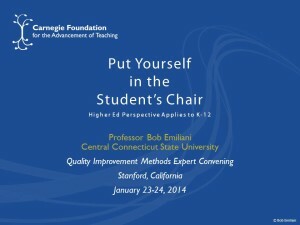 The Carnegie Foundation for the Advancement of Teaching held a meeting on 23-24 January in Stanford, CA, called “Advanced Teaching – Improving Learning: 2014 Continuous Improvement Expert Convening.” The purpose of the meeting was to examine different approaches to researching K-12 education and improving the practice of teaching. I was invited to speak about the Lean teaching pedagogy that I created and developed. (Note: My presentation refers to “The 10 Percent Problem” and “45 Teaching Errors.” Click here for more information on that research). Here is the presentation that I gave (.pdf file, 12 slides).